In the past we have had a number of students who have had the (possibly unconscious) belief that sitting on the chair in the mathematics scheduled class is equivalent to having learnt the content from that lesson. Only to discover that in a few weeks, or in the next term or following year that they were then unable to recall any presumed knowledge. This meant that the student has not actually "learned". As teaching professionals we recognized that we need to do something different, students need the opportunity to learn in more individualised ways, at learning times that are more suitable to them and in a way that can foster deeper connections and richer understanding. This educational approach is not just about teaching mathematics. It is centered on providing our students an opportunity to learn about learning. There is much research (formal and anecdotal) that supports a shift to blended modes including online learning. Blended learning and Flipped Classroom models are reporting continued success in schools both in Australia and around the world. Emerging research clearly shows that students from these learning models are outperforming standard classroom delivery students, especially in areas of Mathematics and Science. Students have been issued with a QR code required for checking in and checking out of class. They must bring these at all times. Students will be required to attend at least 3 and 45 mins of face to face Mathematics sessions each week (this includes Monday Lectures). They need not attend the same session every week (negotiate with the teacher for alternate times), and may attend more if they like. As a result of progress checks, or needs of the unit, the convener may call an ESSENTIAL MODULE. This would mean attendance at a particular time (Likely to be a lunch time). This may include special explanations, workshops or similar activity. Essential Modules count towards their 3hrs 45 mins of class time. This model is designed for optimum learning. To gauge this teachers have a number of methods available to them to monitor academic progress. Regular quizzes - automatically marked and results are recorded. Teachers review the results from the quizzes and will make contact with students if the need arises. There are about 4 or 5 quizzes each term. Online forums - Participation in an online forum discussion is also required each fortnight. Teachers create topics that are designed to encourage deep thinking, considerable understanding of the topic and conversation with peers. Teachers constantly moderate the forums and can comment and provide feedback for students regarding their posts. Investigations - Each week students are expected to engage with the curriculum that is set. The investigation is designed to be a task that can either connect the content to real life applications, enable the student to demonstrate real understanding and connection and allow the student to demonstrate a level of mastery with the weeks content. Face to face contact - Each session the student attends in the learning space allows teachers the capacity to check work and monitor progress. Collectively, these will enable teachers to monitor progress and flag difficulties with students early. These items will constitute satisfactory engagement with the curriculum and will result in participation for that structured learning activity for the week being recorded on the class rolls as an alternate program. Students are required to cover all the content as issued in the learning brief provided weekly. They will have choice about how they learn this material. These resource options will aid with the theoretical components. Practical components would be issued by way of text book questions, links to online questions, or questions as set by the teacher. Students can choose whichever they like for online verse teacher supported model. Some students may like to read material at home and then come for practical instruction, others might like to come for theory and then do practical independently. This is the power in this type of teaching and learning approach. Students are permitted to personalise their learning style. Now, more than ever before, students have access to explicit requirements regarding the work each and every week. This explicit instruction is provided in the "Learning Brief" provided online to students on the Monday of each week. The college will still be able to ensure delivery of the content required by the structure of the BSSS Mathematics Courses. The mode of delivery of instruction is all that is changing. Arnold, R. and M. Ryan, (2003). The Transformative Capacity of New Learning. Melbourne: Australian Council of Deans of Education. Graham, C. R. (2006). Blended learning Systems: Definition, Current Trends, and Future Directions. In C. J. Bonk. & C. R. Graham (Eds. 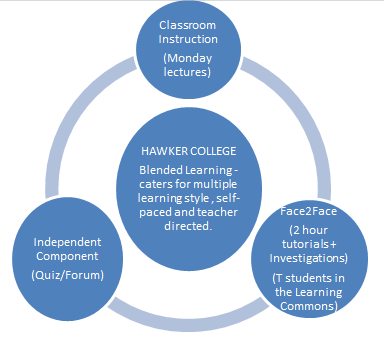 ), The Handbook of Blended Learning: Global Perspectives, Local Designs. (pp. 3-21). San Francisco: Pfeiffer.